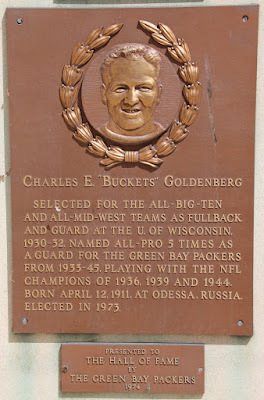 Selected for the All-Big-Ten and All-Mid-West teams as fullback and guard at the U. of Wisconsin, 1930-32. Named All-Pro 5 times as a guard for the Green Bay Packers from 1933-45, playing with the NFL Champions of 1936, 1939 and 1944. Born April 12, 1911, at Odessa, Russia. Elected in 1973. The marker is in this cluster, bottom left.